In Greco-Roman mythology, Leuce (Ancient Greek: Λεύκη, "White", specifically "White Poplar") was the most beautiful of the nymphs and a daughter of Oceanus. Pluto fell in love with her and abducted her to the underworld. She lived out the span of her life in his realm, and when she died, the god sought consolation by creating a suitable memorial of their love: in the Elysian Fields where the pious spend their afterlife, he brought a white tree into existence. It was this tree with which Heracles crowned himself to celebrate his return from the underworld. Maurus Servius Honoratus identifies the tree as the white poplar, the leaf of which is distinctively two-sided, one white and one dark. The double color, Servius says, made a wreath that represented the duality of the hero's labors in both the upper and the underworld. The association of white poplar leaves with Herakles is also attested by archaeological remains, such as the poplar-leaf motif carved on a statue base found in a small sanctuary to Herakles (Roman Hercules) along the Tiber river. It has been suggested that behind the vague outlines of this tale lurks an older myth having to do with Herakles' encounter with the river deity Achelous, who had chthonic associations and whose name was the subject of speculative theological etymology among the Greeks, in this case involving acherōïs, another Greek word for "poplar." In a founding myth of the 1st century BC, Herakles is supposed to have established the Arvernian oppidum of Alesia, the name of which likely derives from the Gaulish word for poplar. Celebrants of the Bacchic rites wore a wreath of poplar leaves to honor the chthonic aspect of Dionysus. At Elis, white poplar was the only wood used in sacrifices to Zeus, according to Pausanias, because Herakles imported the tree and used it to burn the thigh bones of sacrificial victims at Olympia. The oak is the customary sacred tree of Zeus, and the substitution among the Eleans may simply reflect the more widespread growth habit of the poplar there. The hero was supposed to have discovered the tree growing on the banks of the upperworld Acheron in Thesprotia. Pausanias says this is the reason for the Homeric epithet Acherōïda for the white poplar, which was also called leukē in Greek. The white poplar might be worn as a crown at athletic contests in honor of Herakles, a patron of the Olympic games. Its infernal origin made it appropriate for funeral games, which played an important role in the development of Greek athletics. The white poplar was also sacred to Persephone, for whom Leuce seems to be a doublet, as a goddess of regeneration. Robert Graves used the myth of Leuce in developing his poetic theories of mythology. 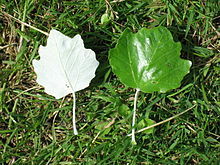 Graves, for instance, holds that the back of the poplar leaf was turned white by the sweat of Herakles. In The White Goddess, he names the white poplar as one of the "three trees of resurrection", along with alder and cypress. ^ Servius, note to Eclogue 7.61: Leuce, Oceani filia, inter nymphas pulcherrima fuit. hanc Pluton adamavit et ad inferos rapuit. quae postquam apud eum completo vitae suae tempore mortua est, Pluton tam in amoris, quam in memoriae solacium in Elysiis piorum campis leucen nasci arborem iussit, ex qua, sicut dictum est, Hercules se, revertens ab inferis, coronavit. ^ Qua corona usus, duplici colore foliorum geminos labores (superorum) inferorumque testatus est. See also Isidore of Seville, Etymologiae 17.4.45: "The white poplar is named because its leaves are white on one side and green on the other. It is therefore two-colored, having marks as if of day and night, which correspond to the times of the rising and setting of the sun" (translation by Priscilla Throop). ^ David Evans, "Dodona, Dodola, and Daedala," in Myth in Indo-European Antiquity (University of California Press, 1974), p. 116. ^ Diodorus Siculus 4.19; Nico Roymans, Ethnic Identity and Imperial Powers: The Batavians in the Early Roman Empire (Amsterdam University Press, 2004), p. 241. ^ Entry on "Alder," Encyclopedia of Indo-European Culture (Taylor & Francis, 1997), p. 11; Xavier Delamarre, Dictionnaire de la langue gauloise (Éditions Errance, 2003). ^ Alberto Bernabé and Ana Isabel Jiménez San Cristóbal, Instructions for the Netherworld: The Orphic Gold Tablets (Brill, 2008), pp. 93 and 125, citing Harpocration. ^ Evans, "Dodona, Dodola, and Daedala," p. 114, citing Arthur Bernard Cook, "Zeus, Jupiter, and the Oak," Classical Review 17 (1903), p. 273. ^ Pausanias, Description of Greece 5.14.2; Iliad 13.389, and 16.482. See also Servius, note to Eclogue 7.61, on Acherōïda, where the underworld river seems meant. The English Renaissance poet Edmund Spenser alludes in The Faerie Queene (Book 2, Canto V, stanza 31) to an association of "Olympick Jove" and the white poplar instead of his conventional oak. ^ Arthur Calvert, P. Vergili Maronis. Aeneidos Liber V (Cambridge University Press, 1879), p. 48. ^ Calvert, P. Vergili Maronis. Aeneidos Liber V, p. 48. ^ Donald G. Kyle, Athletics in Ancient Athens (Brill, 1987, 1993), pp. 10–15. ^ Robert Graves, (1955). The Greek Myths I (London: Penguin, 1955, revised edition 1960), pp. 121, 124-125, and The Greek Myths II, p. 154. ^ Robert Graves, The White Goddess: A Historical Grammar of Poetic Myth (New York, 1948, 1975, 1999 printing), p. 171. The basis for Graves' assertion that Herakles bound his head with white poplar after killing Cacus (p. 193) is unclear. This page was last edited on 27 May 2018, at 20:39 (UTC).